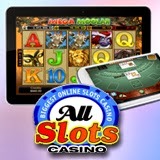 More and more players are making All Slots Casino their destination for casino games on their tablet. The casino has seen an 80% increase in the number of people playing its popular casino games on iPads or other tablet devices, and you can download the mobile and tablet versions directly from the UK App Store. More than 30 games are available on mobile and tablet devices, including progressive jackpot game Mega Moolah, where you could win more than £1 million. You can also enjoy All Slots’ brand new Halloween-themed HTML5 slots Halloweenies and What a Hoot, which were released just this week. A number of other popular games are available to play on the tablet, including Tomb Raider and Thunderstruck, so why not get playing now at one of the UK’s longest-established online casinos? When you sign up to All Slots Casino for the first time you can enjoy a generous £500 welcome package, with a £5 bonus immediately upon registering.